According to 2012 U.S. Census Bureau information, the number of children reared in single-parent households continues to rise. Children with two parents in the home -- earning two incomes -- tend to have better financial and educational advantages. The effects of a single-parent home on a child’s behavior can be far-reaching and impact several areas of life, including academic achievement and social behaviors. Most single-parent households are run by mothers, and the absence of a father -- coupled with lower household income -- can increase the risk of children performing poorly in school. The lack of financial support from a father often results in single mothers working more, which can in turn affect children because they receive less attention and guidance with their homework. Researcher Virginia Knox concluded from data from the National Longitudinal Survey of Youth, that for every $100 of child support mothers receive, their children's standardized test scores increase by 1/8 to 7/10 of a point. In addition, Knox found that children with single mothers who have contact and emotional support from their fathers tend to do better in school than children who have no contact with their fathers. Having only one income earner in the home puts single parent households at risk for poverty, finds research compiled by the University of Washington's West Coast Poverty Center. Living in poverty is stressful and can have many emotional effects on children, including low self-esteem, increased anger and frustration and an increased risk for violent behavior. 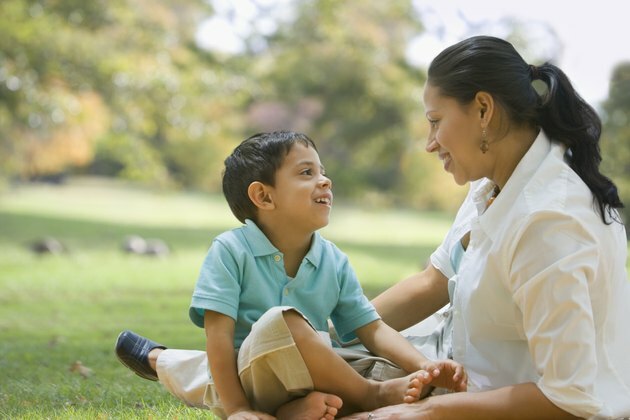 Besides financial constraints, other emotional effects of growing up in a single parent household may include feelings of abandonment, sadness, loneliness and difficulty socializing and connecting with others. Effects vary from child to child, however, and the individual parenting style of the single parent is also a big influence on the child’s development. Single parenting can have positive effects on children as well, depending on other factors such as personality types and parenting techniques. According to a study at Cornell University, positive single parenting did not show any negative impact on the social and educational development of the 12- and 13-year-olds participating in the study. In addition, children in single-parent families may exhibit strong responsibility skills, as they are often called upon to help out more with family chores and tasks. Children in single-parent families often form close bonds with their parent, as they are closely dependent on each other throughout the child’s life. Children from single-parent families may also form closer bonds with extended family members or family friends, as these people often help raise them.